It might all depend on who the new coach is though. I see that Jake McGing has started the last two games in Poland and played the whole of each game. Fair cop, I didn’t think he’d play at all so good on him for giving it a go and making it work. It would be easy to say they will find out his ability level soon enough, but I also have to ask how strong the Polish league is these days compared to others? As a squaddie, the money there wouldn’t be that much bigger than here, would it? He can really only hope to impress and see if he can get into a bigger league over in Europe in a few years. Juric going to Indonesia? Surely a strange move that? Socceroos striker Tomi Juric has been linked with an unlikely move to the Indonesian Premier League. For the dollars? Yes. But I admire him at least for not making the easy option of big dollars in China for a year and damaging his career, unlike Sainsbury. He’s taller than the goalkeeper for fucks sake!! 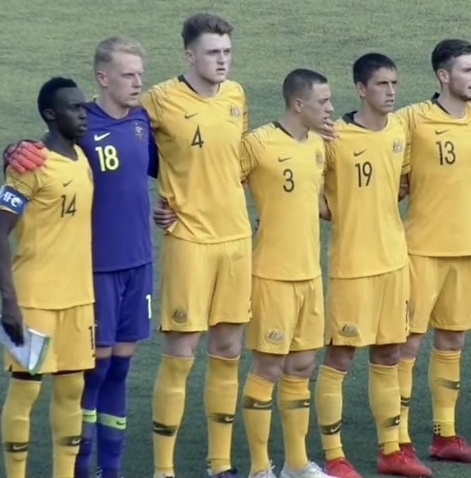 He was made in Scotland and has never even set foot in Australia - but towering defender Harry Souttar is being hailed as a Socceroo-in-the-making. Play him up front. Let’s take football back to the 90s. Look at him next to Gersbach! I know he’s not tall but he looks like a 10 year old next to this dude.